Back in college, there was this trick to buying used books for class: If you were smart, you’d flip through and look in the margins to see how good the notes were. Openmargin, a start-up based in the Netherlands, is employing the old used-textbook trick to bring a similar experience to just about any e-book around. 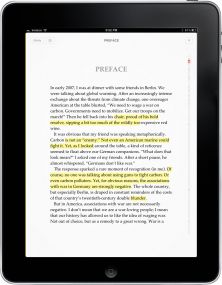 The company of three co-founders has built an iPad app, also called Openmargin, which allows users to create marginalia in their e-books, by indexing notes they take and comments they share to a highlighted area. Anyone else using the Openmargin app to read the same e-book will see the highlights and be able to drill down into the comments. 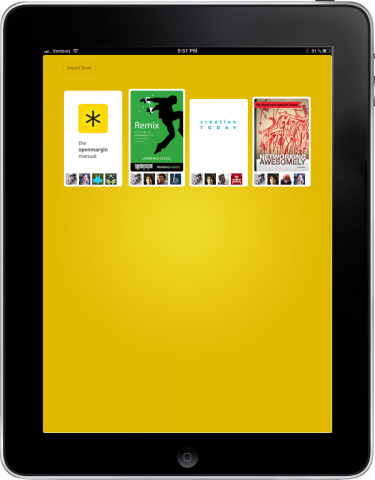 At scale, that could mean downloading an e-book, opening it inside the Openmargin app, and discovering all kinds of shared thoughts, debates and conversations that had been “hidden” in the e-book you’d had all along. But scale is a long way off. Openmargin’s bet is that books are a natural fit for this emerging generation of topic-based, ad hoc social interactions, because books are full of ideas that can be discussed. But Openmargin, like many companies attempting to create in copyright-heavy industries, faces a hard reality — there are big rights-holders who want big profits, and it’s a long road to partnership. Today, Openmargin is avoiding the issue by only offering its services around e-texts that don’t have any rights management restrictions — known as DRM-free. That means it will work for any texts in the public domain, and most books published under the various Creative Commons licenses. That’s still a very small subset of books — especially on big e-book sites such as Amazon and Apple — which makes it a very large problem for Openmargin moving forward. Köhlbrugge and crew are all based in Amsterdam, where the three-year road to start-up life has looked a little different than it might had they lived in Silicon Valley. The company was initially funded not by angel investors, but by a national government grant for companies making innovations that were “culturally relevant,” Köhlbrugge said. The company still hasn’t taken any private investment, but is now seeking another grant to make its first full-time engineering hires.